These pictures were taken the other day when my daughter Rylie was craving for something sweet. 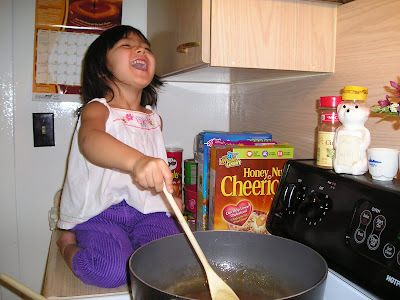 She really love sweet rice and she wants to help me all the time when I cook. 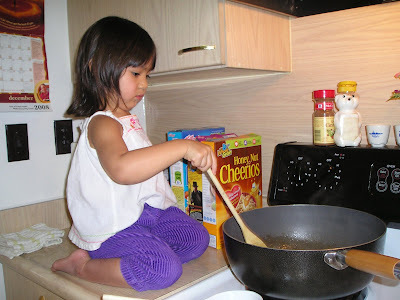 I can't cook anything without my future chef's presence. 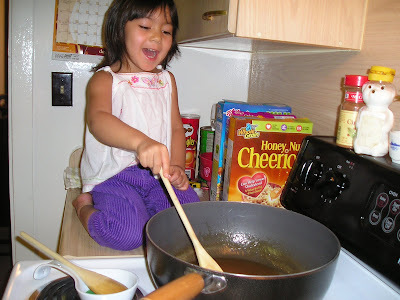 She would give me hard time if i cook without here hehehe. I just don't like her being around when I am frying something because I'm scared that the hot oil will splatter on to her face or skin. She's very happy that I let her help and she was proud too! She's actually demonstrating what we have to do hehehe... I love you Anak, may you stay loving and sweet! I am so thankful that God gave me two precious angels that lifts our spirits every single minute of our life. They're the reason of our smile and the source of our strength in order to keep going everyday. 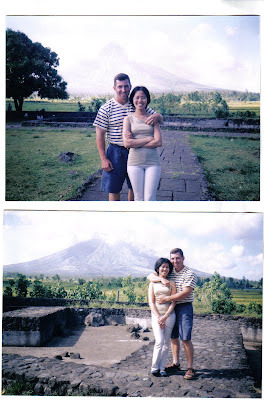 We were actually engaged in this picture which was taken in Cagsawa Ruins. Can you remember the day you first met your hubby? Yeah, kinda hahaha.. Nahh I'm just kidding. Of course I do hahaha! When was that? That was March of 2003 at the Airport in Manila. First impression. Gosh, he was so muscular for me hahaha! He lost weight after that hehehe.. He is very gentle, always smiling and there's no dull moment for us because of his humor. Were you friends before he became your bf? We've chatted and talked over the phone for almost 4 months. What was the sweetest thing he did for you? A month after we've chatted, he ordered flowers and chocolate online and have it sent to me. What are the things about him that you are thankful for? 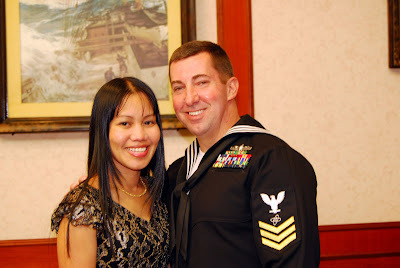 I am thankful that John is very loving as a Dad and husband; that he understand my financial obligation with my family; that he support whatever I do; that he is passionate; that he can do household chores (its rare to find a husband that can do that right? ); that he finds humor in every little thing; and most importantly that he loves me and the kids so much! We love you too Dad! *Now the rules are simple. 1. Pick your sweetest picture when you were still friends and post it on top of the questions and answers. 2. Another pic now that you are together post it after the questions. 3. Share to how many friends you like. 4. Enjoy doing it c: 5. Let your hubby read it too c: I am tagging demcy, malou, faye, cookie, leslie, niko, amy, lil' prince mommy, grace, joanna, anna, ate weng, youngest, mom of four, mars, kylie, and tiffiney.